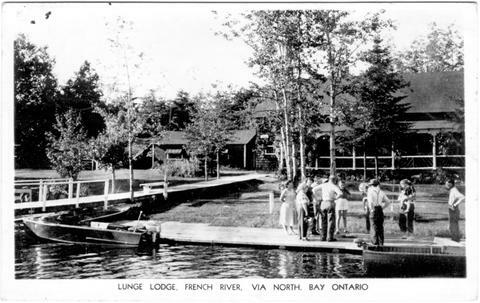 Postcard was cancelled at Lunge Lodge, ON on 15 August 1950. Addressed to: Miss H. Mackenzie. Woodroffe. Ontario. Message reads: French River, Aug. 14. Dear H---. I haven't time to print this. I'm sorry. We have only 15 min. here while the boat stops to load passengers and supplies. We'll see you soon. Love, Jean.